Two years after vanishing into the Sudanese desert, Professor Harold McCabe comes stumbling out of the sands, but he dies before he can tell his story. Then an autopsy uncovers a bizarre corruption: someone had begun to mummify the professor’s body—while he was still alive. Subsequently, the medical team who had performed the man’s autopsy has fallen ill with an unknown disease. Fearing the worst, a colleague of the professor reaches out to Painter Crowe, the director of Sigma Force. The call is urgent, for Professor McCabe had vanished into the desert while searching for proof of the ten plagues of Moses. As the pandemic grows, a disturbing question arises. Are those plagues starting again? To unravel a secret going back millennia, Director Crowe and Commander Grayson Pierce will be thrust to opposite sides of the globe. As the global crisis grows ever larger, Sigma Force will confront a threat born of the ancient past and made real by the latest science—a danger that will unleash a cascading series of plagues, culminating in a scourge that could kill all of the world’s children . . . decimating humankind forever. The book was excellent. 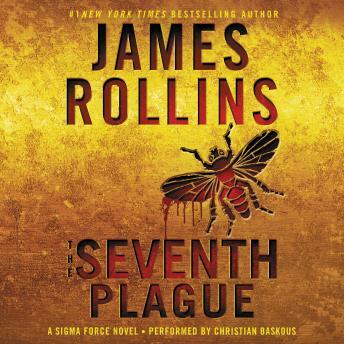 Who but James Rollins can write a tale involving the Bible, Tesla, Mark Twain, elephants, Stanley and Livingston? I have read other books by this author and was never disappointed. I agree with the reviewer who said the narrator went too fast, not consistently, mostly in the beginning. I thought he did some character accents well , Noah for instance. In the end I got comfortable with his voice, it wouldn't deter me from purchasing another book that he narrates. Narrator went way too fast and inflections in his voice were strange, accent made it hard to understand. Will never download a book with this narrator. Interesting premise dealing with the Biblical plagues. I enjoyed the twist put to the ancient plague stories which makes one stop to think things over again.